When trying to work out the cost breakdown of brewing at home versus buying commercial beer, it largely depends on how frugal you want to be and if you buy really inexpensive commercial beer, hyper-local microbrew, or something in between. Initial set up costs can range vastly. We are frugal (as you know) and quite used to reusing and repurposing in other areas in our lives so why would brewing be any different? We try to make do with what we have on hand as much as possible. Brew Pot - Engineer used our turkey fryer. Huge pot. Check. Heating element. Check. Perfect. No need for specialty equipment. Temperature Control - A candy thermometer is great for this although I think the first couple of times, Engineer used the turkey fryer's thermometer. Mash Tun - That's what they call the bin that holds the grains while they steep. He adapted an extra cooler we had on hand. It keeps the temperature fairly constant. Bottles - Bottles can be about $.50 a piece. No big deal right? Well when one batch makes 50 bottles you've added a substantial cost to your end total. For both wine and beer, we ask our friends to save their bottles for us. It is the BEST way to recycle since they know that some bottles will be returned to them filled. Cleaner - There is an expensive cleaner called PBW that many brewers use but OxyClean works just as well for general cleaning and is about a third of the price. Engineer still uses PBW on brew days because it rinses cleaner but the rest of the time he uses OxyClean. By using OxyClean, it makes the PBW stretch further. Stir Plate - Many brewers want maximum cell growth from their yeast. A stir plate keeps the yeast suspended with plenty of oxygen to maximize cell growth and prevent it from going dormant. Engineer fashioned a stir plate using a fan out of an old computer. Grains - You may not be able to save much on the grains but you CAN get a higher return on your investment by reusing them. If you reuse them, the cost is negligible. If using oatmeal in your recipe, you can use old fashioned oats bought from anywhere which are most likely cheaper anywhere other than your brew store. Herbs/Flavorings - Specialty brew stores will happily sell you cacao nibs or juniper berries in little packets at inflated prices but you could buy cinnamon sticks or vanilla pods or whatever you are using to flavor your beer, in bulk from Sam's or Amazon or Azure Standard. Engineer asks me if I have certain ingredients on hand before he buys them. Hops - Grow your own. We haven't gone this far yet - maybe next year. Hops are beautiful plants fresh or dried, can be eaten as a vegetable, have medicinal properties, AND flavor brews. Yeast - You can actually keep your yeast from previous brews and use it as a starter for future brews. You can also use the "trub" (leftover yeast from brewing) in baking. As you get more adept at brewing, you may want to start buying specialized equipment in order to refine your process but using what you have on hand works for me. 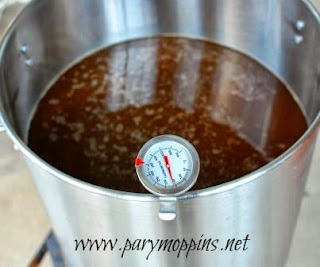 I have always wanted to try my hand at home brewing :) Thanks for such an informative post! I'm pinning for later. This is Engineer's latest fun project. He has really enjoyed the research and process. I have a friend who brews his own beer and it's always fun to get to sample his creations. Love the idea of recycling bottles. Wow- you have this down! I am so impressed- this has always seemed like a pretty mysterious process to me....and you're not only doing it, but doing it frugally! I'm not either Ms. Jennifer. This is all Engineer's project. :) I get the spent grains and "trub" to bake with though. I pinned this for later reference. My dad likes to brew and my best friend's hubby likes to brew as well. Great info! I'm just starting to brew at home so this is awesome! Thanks for sharing! I went over and pinned it! I have talked with Engineer about possibly sharing some of his recipes or things he has learned along the way in regards to brewing. Hopefully, he will agree to do a little guest posting for me. :) Thanks for stopping by!